There’s always that time between meals that we get a little hungry, and reach for a snack. But have you taken a look at the snacks you are reaching for? So many of the typical snacks are filled with all kinds of things that we don’t like to put in our bodies. 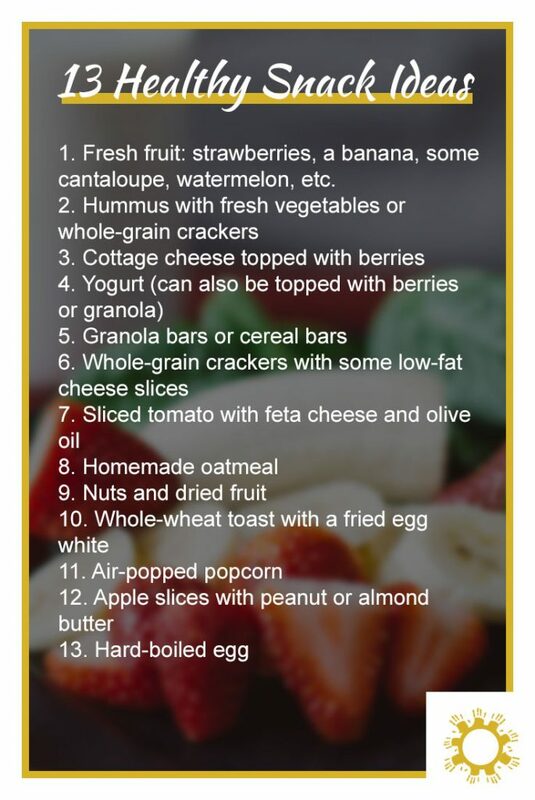 I have compiled a quick list of some easy healthy snacks for you to try next time you need a little something between meals. Fresh fruit: strawberries, a banana, some cantaloupe, watermelon, etc. These may not be quite as tasty as some of the other snack you sometimes reach for, but they are much better for you. Many of these are snacks that you could pack and easily bring to work or school with you to grab on the go. You’re really a health-conscious mom. Hummus with fresh vegetables or whole-grain crackers is such an original idea. I would love to try making it someday! I love finding healthy snack ideas that me and the kiddos can easily make and enjoy. Anything that has fruit is a winner in our house. These are all so yummy. These are all great ideas, and I need to try more of them. I’m such a bad snacker and tend to head for empty calories like cookies and chips. I do love air-popped popcorn! These are great suggestions. I’m great at making healthy meals…but I always seem to struggle with the snacks. I like crunchy things like chips and always forget to have an alternative on hand!! These are wonderful suggestions, fresh and healthy. I prefer fresh fruits, easy to carry on my bag and to eat! These are some amazing suggestions! We all feel like munching between the meals and sometimes even in the midnight, and these snack ideas sound super healthy and easy! I never thought about eating hummus with fresh veggies! It’s such an healthy option, I’m definitely going to try this now!